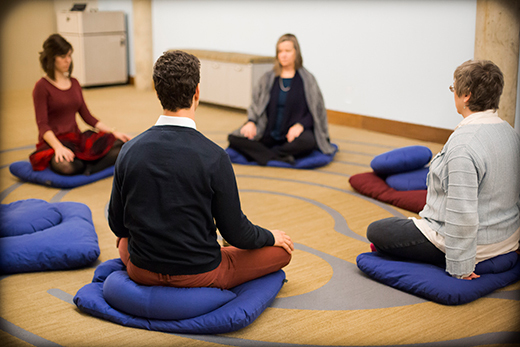 With the end of the semester nearing, relax and unwind with guided meditation with the Emory Buddhist Club on Dec. 13. It’s December and the holidays are here. With the end of the semester, chances are you have some flexibility in your day and may be able to take advantage of some of the many events and offerings of learning and fun at Emory. Here are some holiday, non-holiday and new experiences for you to enjoy this month. 1. Enjoy the tradition of holiday music at Emory. A Festival of Nine Lessons and Carols, an Emory tradition established in 1935, continues with a candlelit service of choral music and scripture readings by special guests from the Emory community. This event will be held on Friday, Dec. 7, and Saturday, Dec. 8, at 8 p.m. and also on Dec. 8 at 4 p.m. in the Glenn Memorial Auditorium. Tickets for Emory students are just $5, although faculty, staff and other audiences will need to up their budget to $20 for this popular event. Later in the month, Santa’s Favorite Chamber Music features classical music, then Santa Claus leading a sing-along on Sunday , Dec. 16, at 4 p.m. in the Michael C. Carlos Museum’s Ackerman Hall. That concert, part of the family series, is free. If you have some flexibility in your schedule here at semester’s end and you haven’t seen this amazing structure, take advantage of the last scheduled tour until next year. Sign up for the tour on Friday, Dec. 7, at 9:30 a.m. at the WaterHub on Peavine Drive. It’s free. 3. Pick up some special gifts at a sale. The Michael C. Carlos Museum Bookshop holds its Holiday Sale on Friday, Dec. 7, and Saturday Dec. 8, starting at 10 a.m. each day. Items include books on art, history, world cultures, religion, folktales, myths, contemporary world fiction, graphic novels, plus jewelry, imported fair trade craft gifts, artsy 2019 wall calendars, educational books for children, notecards and holiday cards, and replica ancient statuary. 4. Experience a concert of Javanese music. The Emory Gamelan Concert: Infinite Hope will be Saturday, Dec. 8, at 5 p.m., showcasing a full Javanese gamelan set. This will be the culminating performance after a three-week residency of master musician Darsono Hadiraharjo of Cornell University and features one of his original compositions. A $10 donation is requested. Students are free. 5. Follow some footsteps at dance events. On Sunday, Dec. 9, at 5 p.m., Fieldwork Showcase features new work created by Atlanta artists from Emory Dance’s partnership with CORE Dance and The Field in New York. Tickets are $7. Students from a variety of dance classes will demonstrate work learned during the fall semester at the Dance Program Informal Showing. This free performance is Tuesday, Dec. 11, at 5:45 p.m. Both events will be at the Dance Studio in the Schwartz Center for Performing Arts. The Emory Buddhist Club welcomes everyone to learn about meditation. There will be a short, guided meditation, discussion and tea on Thursday, Dec. 13, beginning at 6 p.m. in Room 106 of Cannon Chapel. The session is free as is parking in the Peavine lot. You can contact them at EmoryBuddhistClub@gmail.com. 7. Participate in a love feast. 8. Celebrate the holidays the German way. Join the German students, faculty and staff to bake cookies and celebrate the German/Austrian way at Weihnachtsfest at the German House on campus, 733 Clairmont Tower. This event is Friday, Dec. 14, from 5 p.m. to 7 p.m.
9. Take the last chance to see two campus exhibits. Speaking of endings in December, the “Tell Them We Don’t Die” exhibition, curated by the Emory Center for Ethics’ Carlton Mackey, wraps Friday, Dec. 14, at the Center for Ethics. The art in another exhibition, The Spirit Lives On: Art and the Mind, to raise awareness about dementia, will be displayed through Monday, Dec. 31. Both are free. 10. Cheer on the Eagles basketball teams. Oxford Men's Basketball plays Florida Gateway on Saturday, Dec. 8, at 4 p.m. at the Oxford College gym. Also, at 4 p.m. that day, the Emory Women’s Basketball team takes on Birmingham Southern. On Tuesday, Dec. 11, the Emory Women’s Basketball team will play Agnes Scott College at 5 p.m. The Emory Men’s Basketball team will also play Dec. 11; they take on Berry College at 7 p.m. And when you’re looking for something to do the last week of December, consider attending the Emory Men’s Basketball team’s game against Oswego on Saturday, Dec. 29, at 4 p.m. All Emory games are held in the Woodruff PE Center. All games, Emory and Oxford, are free.